This is a little late, I've had these in my review box since last month but as my nails had broken all my nail swatches are late and are now going overdose Dolce Vanity. 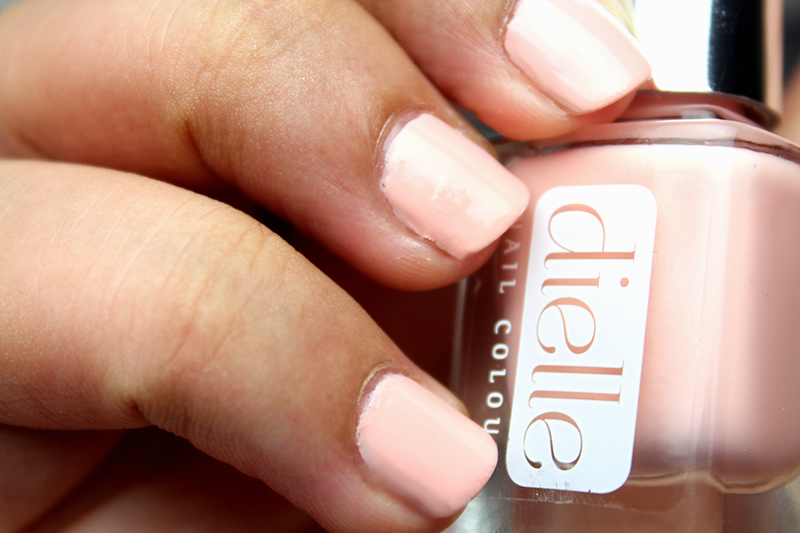 I took up the offer to review Dielle UK nail polish as I liked the idea of the gel top coat and that these polishes are non-toxic so you will not find any Toluene, Formaldehyde, DBP, Camphor, & Pthalic Acid within their ingredients. Also not forgetting that they also have taken into consideration all skin-tones and have selected colours that can be suited for all. Dielle also give 30% profit to reliable organisations in Hati, Ros the owner of Dielle lived in Port-au-Prince for over 14 years and she is committed to helping those organisations that are truly making an impact with Women and Children in Hati. It's a soft pink colour that's very subtle and beautiful. It's a delicate colour that will even suit the pale to the darker skin-tones. It's one of my favourites right now, due to the softness that it gives my fingers. - Sounds odd right?! Very girlie, so it's quite the opposite to myself yet I adore it. smooth and gives a nice seal to the colour. I have never heard of this brand before but I love the concept of giving back to community projects in Haiti, its a shame more companies do not do this and it seems to be all greed and max profit with them. Its looking great colors and i really like this one.I have seen wide rang of beauty skincare products which you can get easily and more helpful. Seems like interesting, haven't tried it yet. I was waiting for the review and thanks for a positive review.